Abu Dhabi GP preview: Will this be a record-breaking season finale? 2018 has come and is almost gone, and a whirwind F1 season, which swayed between Ferrari and AMG Mercedes Benz protagonists Sebastian Vettel and Lewis Hamilton, closes out with this weekend’s Bahrain Grand Prix in Abu Dhabi. The Yas Marina circuit, flanked by the Ferrari World theme park, has been the site of some thrilling races in the past, and possibly also the most famous radio chatter in recent history. Who can forget Kimi Raikkonen’s comical and now legendary , "leave me alone, I know what I’m doing", radio message in 2012, when, driving for Lotus, the Iceman had to fend off a hard charging Alonso in a Ferrari, or Vettel winning his 1st title in dramatic fashion in 2010 with Red Bull, or 2016’s tense showdown between Lewis and Nico at Mercedes. The form books say this will be a Mercedes exhibition. Hamilton shares three wins apiece with Vettel at the circuit. Mercedes have scored 1-2 finishes the last four races, two for Hamilton, and one each for Rosberg and 2017 winner Valterri Bottas. They have locked out the front row on each of those occasions and go into Sunday’s race with the goal of being the 1st team in F1 history to have five consecutive front row lockouts and 1-2 finishes at the same venue. 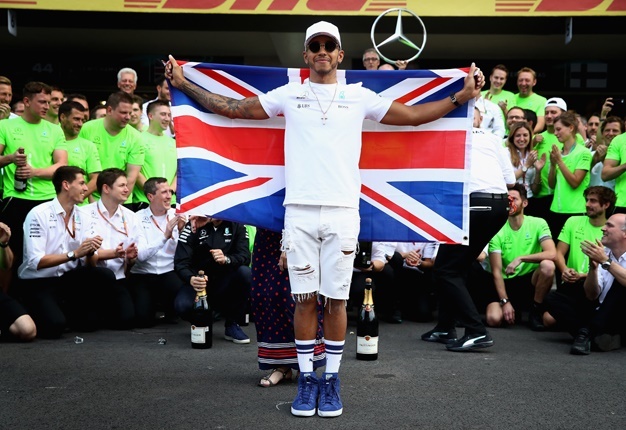 The team has won 10 races this season (all won by Lewis Hamilton) and if Hamilton can win on Sunday he will equal his best results achieved in 2014 by taking 11 wins in a season. On the other side of the garage, Valterri Bottas will be eager to score a win, having lost out in Russia, and Germany where he was challenging for lead when called off and instructed to hold position. If Valterri does not win, he will be the 1st Mercedes driver not to score at least 1 win since the start of the turbo-hybrid era. The last Mercedes driver to go winless in a season was Michael Schumacher in his last season in 2013. The 2018 Constructors Championship having been wrapped up in Brazil, and with Lewis’ winning the Driver’s Title in the Mexico, Team Manager Toto Wolff has said the team can now 'go for broke". This statement may be a touch difficult, as Hamilton goes into the race with a damaged power unit, which may mean either he runs an older spec with high mileage, or risks a DNF (did not finish) with the current unit, OR as many are hoping, gets a new PU turned up to 11 and gives a demonstration of what the Mercedes is ACTUALLY capable of. For this race, the Hammer will not run his usuall #44 race number, but will carry the #1, befitting the World Champion. Bottas will be looking at securing the win, as mentioned earlier, and also 3rd place in the championship. The points gap between Kimi Raikkonen, currently in 3rd, and Max Verstappen in 5th place is 14 points, so there is still some silverware and pride left to fight for in terms of end of season standings. The form man at the moment is Max Verstappen. He goes into Sunday seeking a 2nd win in 4 races, with 2 second place finishes in Austin and Brazil being the other 2, and showed in Brazil that the Red Bull has inherent pace on circuits not overly power sensitive. The car is also very kind on its tyres, something that will certainly aid him in his quest for a win, as Pirellis have sent their softest 3 compounds for the race – the red striped supersoft, purple ultrasoft and pink hypersoft. Teammate Daniel Ricciardo starts his 150th Grand Prix, and his 100th and final race for Red Bull, hoping to go out on a high. The plucky Aussie has had the worst reliability this season, with 8 DNFs and will want a good showing before moving on to the Renault works team next year. This race also sees the curtain coming down – at least for now- on Fernando Alonso’s career in F1. The former 2x World Champion will bow out of F1 after Abu Dhabi after 17 years and 311 starts. He has taken 32 wins and 97 podiums in his career. Mclaren are running a special livery for this race to honour their star driver, and Alonso will also have a different helmet design, incorporating elements of his helmets early in his career. Known as one of the toughest competitors on the grid, sadly, the Spaniard’s career has been hampered with uncompetitive machinery since the heydays of his 2005 and 2006 titles with Renault. He will pursue Indycar next year, where he aims to win the Indianapolis 500 and become only the 2nd driver to win the fabled “Triple Crown” of motorsport – The Monaco GP, Le Mans and the Indy 500 – behind the legendary Graham Hill. Although a comeback has not been ruled out, it needs to be seen if indeed Fernando will ever return to the grid in a competitive car. At Ferrari, Kimi Raikkonen starts his final race for the Scuderia, before moving back to Sauber, where it all began in 2001. Should the Fin finish with a podium, he will equal his best podium results in a season, matching his 2005 and 2007 seasons, when he was runner-up and champion respectively. In the fight for best of the rest Constructors, it is Renault vs Haas for 4th and 5th in the Constructors, and then a tight little fight between Mclaren, Force India and Sauber for 6th, 7th and 8th. Torro Rosso lie 9th and Williams are destined to be the wooden spoon winners down in 10th place. The Circuit itself was designed by Herman Tilke, and incorporates a good mix of sweeping fast corners in sector 1, followed by 2 long straights (both DRS zones) in sector 2 and a very tight and twisty sector 3. The layout has suited the Mercedes (sector 2) and Red Bulls (sector 1 and 3) in the past and can dish up some very good racing. Passing is difficult even with DRS and the teams need to cope with soaring daytime temperatures before the circuit cools as night falls. This factor becomes more important given the tyres chosen by Pirelli for this year, which tend to the softer side of the spectrum. All in all it looks set to be a very good race, and my prediction is for the fight to be between the Mercedes and Red Bulls, unless Ferrari can spring a surprise after their dismal showing in Brazil. The race for best of the rest will be quite entertaining too, as the mid field runners sort themselves out. Although the softest tyre compounds have been chosen, I expect it to be a 1 stop race, with the top teams possibly throwing a bit of strategy around. A start on the supersofts with a switch to the ultras as it cools looks to be faster, but you risk losing position off the line, while starting on ultrasofts will mean having to control the stint to make the tyres last, before switch to red stickered supersofts. FP2 and FP3 will give a clear idea of who has race pace on which tyre. It's the last race of a cracking 2018 season, let’s hope they all “go for broke” and we send of the season with classic encounter.